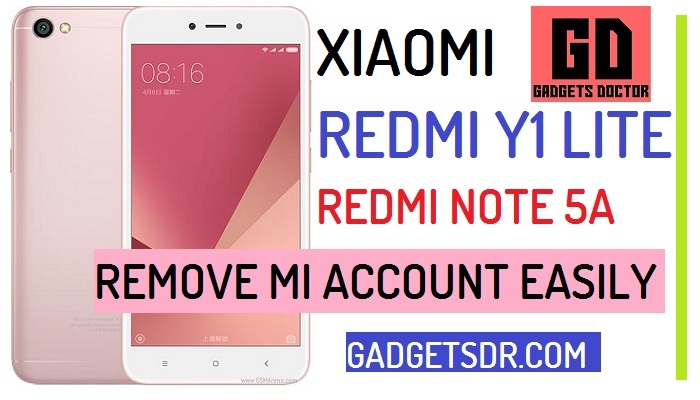 If you owner of Redmi Y1 Lite and Note 5A want to Remove MI Account Xiaomi Redmi Y1 Lite, Note 5A, Here today in this process I will share with you the latest updated method to Bypass MI Account on your Xiaomi Redmi Y1 Lite and also Note 5A. If you hard reset your Redmi Y1 Lite then after the power on your device it will ask to verify old previously synced Mi account then you will access your Y1 Lite home screen. here we share the method to easily Remove MI Account Redmi Y1 Lite, Redmi Y1 Lite is a 5.5inch super IPS touchscreen with 4G voLTE enabled smartphone and powered by SD425 processors and the GPU is Adreno 510 and this device has 16GB of ROM storage along with 2GB of RAM and supported up to a 128GB expandable memory card, Redmi Y1 Lite runs on Android (7.1.1) Nougat MIUI 9 Custom operating system. Redmi Y1 Lite has a 13MP single rear camera also has 5MP of single front selfie camera. and the Battery power of this device is 3080mAH Li-ion battery, and if you owner of this device and want to Remove MI Account Redmi Y1 Lite, then you are here on right place follow the below guide to add a new Mi ID and bypass MI verification to access your device home screen. to follow this process you need to download some files and need a working PC please follow all steps very carefully to Remove MI Account Redmi Y1 Lite by Miracle 2.58 tool. We are showing you the easiest way to Remove MI Account Redmi Y1 Lite and Note 5A, we have tested it a couple of times to remove Mi-Account on Redmi Y1 Lite and Note 5A. this is a very useful way to remove or bypass MI Account on Redmi Y1 Lite and Note 5A. Now it introduces by Xiaomi.inc, This is anti-theft security. it’s measure to ensure that your device reset remotely without removing the MI account from your Xiaomi devices, It’s the part of Latest Xiaomi Android security system. So here we share with you a new way to remove the MI Account lock from your devices, so that’s why we are here to teach you the right way to bypass MI Account form your Xiaomi devices. If you forget your MI Account and without removing the MI Account from your device if you remotely hard reset your device then you need to bypass or remove the previously synced the Mi Account to your Mi device. We are here to share you some simple tricks to Bypass Mi-Account or Remove Mi Cloud account. or share some tricks to Bypass Google Account and Bypass FRP verification from Android devices very easily. -To successfully Bypass MI Account Redmi Y1 Lite and Note 5A you need to download some files from below. -We need “EDL” mode to remove MI Account Redmi Y1 Lite and Note 5A. -Then click on the model select list and select there “Redmi 4A” model. -Done, you have successfully Remove MI Account Redmi Y1 Lite and Note 5A. Thanks for visiting us, Comment below if you face any problem With Remove MI Account Redmi Y1 Lite and Note 5A, we will try to solve your problem as soon as possible. you can check other some tutorial here to help you. i cannot click start button. the driver is installed and i already in EDL mode for xiaomi.